The legacy import page is not fully migrated to new architecture yet. Configuration in import step 1 (such as data source, separators, other settings). Entity fields matching to data source columns in import step 2. When using word entity, we are referring to a business entity from PrestaShop, such as Product, Category, Address, etc. 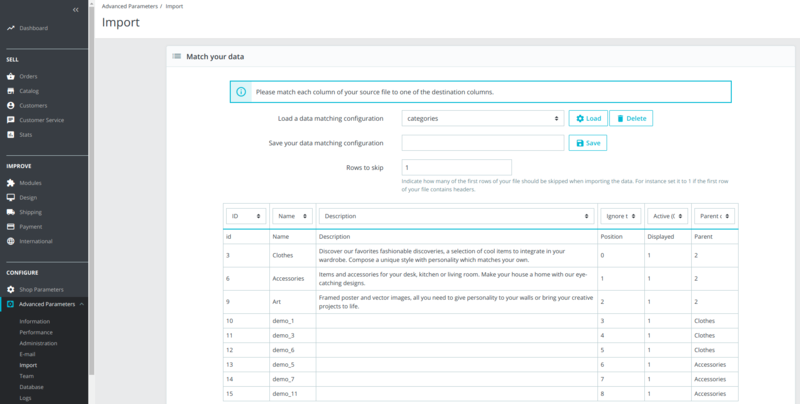 This page consists of import configuration, where you select the import data source and choose wanted options, such as field separators, import language, whether old data should be truncated or not, etc. All configuration which is selected in this page, is represented by the PrestaShop\PrestaShop\Core\Import\Configuration\ImportConfigInterface. The default implementation of the mentioned configuration interface (PrestaShop\PrestaShop\Core\Import\Configuration\ImportConfigInterface) in PrestaShop can be seen in PrestaShop\PrestaShop\Core\Import\Configuration\ImportConfig class. This class is a value object, which values are not supposed to change during one import operation. The default ImportConfig implementation can be instantiated using the factory PrestaShop\PrestaShop\Core\Import\Configuration\ImportConfigFactory. Number of rows to skip from the top of import file. Entity fields matching to data source columns. The number of rows to skip from the top of import file value is also held in the default ImportConfig implementation and is exposed by the PrestaShop\PrestaShop\Core\Import\Configuration\ImportConfigInterface. The interface fits well for this configuration value, because the value is not supposed to change during the import operation. Entity fields matching can be explained as selecting which of the available entity fields is represented by which column in the import file. Import entity - represented by PrestaShop\PrestaShop\Core\Import\Entity. Entity field - represented by PrestaShop\PrestaShop\Core\Import\EntityField\EntityField. Data row - represented by PrestaShop\PrestaShop\Core\Import\File\DataRow\DataRow. Entity field is described by an implementation of PrestaShop\PrestaShop\Core\Import\EntityField\EntityFieldInterface. Entity fields are stored in collections, by implementing PrestaShop\PrestaShop\Core\Import\EntityField\EntityFieldCollectionInterface. Entity field collection default implementation is this class: PrestaShop\PrestaShop\Core\Import\EntityField\EntityFieldCollection. Entity field collections are provided by providers, which implement PrestaShop\PrestaShop\Core\Import\EntityField\Provider\EntityFieldsProviderInterface. Every entity, which is available for import in PrestaShop, has it’s own fields provider in the PrestaShop\PrestaShop\Core\Import\EntityField\Provider namespace. DataRow is an object representation of a data row from import source file. DataRow is described by an interface PrestaShop\PrestaShop\Core\Import\File\DataRow\DataRowInterface and can be used in collections to represent multiple rows of data. DataRow collections can be built using DataRowCollectionFactory, which should implement the PrestaShop\PrestaShop\Core\Import\File\DataRow\Factory\DataRowCollectionFactoryInterface. The import operation can be imaged as multiple smaller import processes running one after another, until the data is fully imported or critical errors occur. To run the import process we have to prepare the configuration for it. As mentioned in previous topics, there are two configuration objects (ImportConfig and ImportRuntimeConfig), that have to be prepared for the import process. Both of them can be built using factories, which are described by interfaces PrestaShop\PrestaShop\Core\Import\Configuration\ImportConfigFactoryInterface and PrestaShop\PrestaShop\Core\Import\Configuration\ImportRuntimeConfigFactoryInterface. To handle the import process we must prepare an ImportHandler, which will have access to our specific logic for import operation. The ImportHandler should implement PrestaShop/PrestaShop/Core/Import/Handler/ImportHandlerInterface. * Executed before import process is started. * Imports one data row. * Executed when the import process is completed. setUp() - executed before each import process. You can set prerequisites in this method, log some data, or execute additional operations that should be executed before starting the import. The method has both ImportConfigInterface and ImportRuntimeConfigInterface as arguments, meaning you can access the configuration if needed for import preparation. importRow() - executed for every row that’s being imported. This method should run the logic, that imports the data for one row. In addition to import configuration, this method also has a PrestaShop\PrestaShop\Core\Import\File\DataRow\DataRowInterface as an argument, which is an object representation of the current row from the import data source. tearDown() - executed when the import process is finished. Useful for actions that have to be done only once after each process. The Importer is responsible for running the import logic from ImportHandler, and applying the import configuration properly during the process. Importer is an object that implements the PrestaShop\PrestaShop\Core\Import\ImporterInterface. PrestaShop comes with one Importer implementation (PrestaShop\PrestaShop\Core\Import\Importer), which can be easily used for your needs. import() method accepts the import configurations and the import handler implementation as arguments and will execute the import logic automatically. The processImportAction() controller action (from the example below) imports one batch of the import data at a time. It can be run multiple times, until all data is fully imported. Responsible for validating selected entity fields in import page 2 data table. It makes sure that you don’t miss any required fields, prevents you from selecting same field twice and shows error messages if you do. Calculates the most reasonable batch size for each import process, depending on server’s response time. It adapts the batch size of the next import iteration by measuring how long it took for the server to process the data in previous import iteration. Responsible for pagination functionality in the import data preview table. The pagination arrows appear below the data table and can be used to peek the source file preview forward or backwards. Responsible for saving, loading or deleting import matches configurations. Import match configuration allows saving the matched entity fields for later reusability. Responsible for checking if POST size limit is being reached. It’s used in each import process, to make sure it won’t reach the limits. Responsible for displaying the import progress for the end user in a modal window. It updates the progress bar of the modal, displays messages, shows/hides the buttons in modal when asked for. Executes import process and fires AJAX import requests continuously. 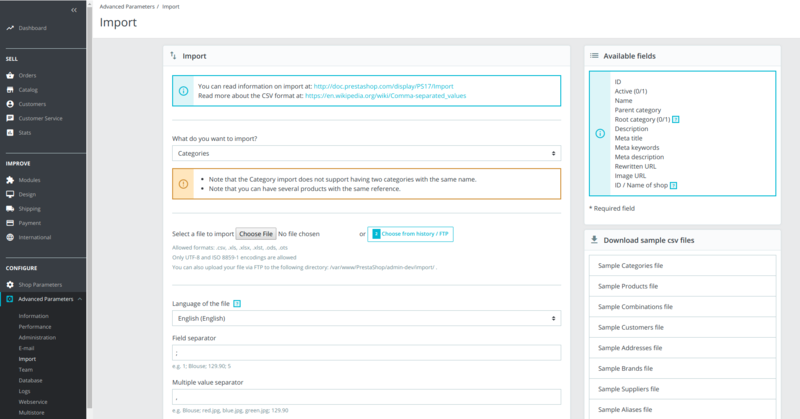 It uses the PostSizeChecker, ImportBatchCalculator and ImportProgressModal components internally and connects them to execute the import process. Responsible for running the Importer component when the end user clicks Import button. Collects data from the import match configuration form and passes it to the Importer.